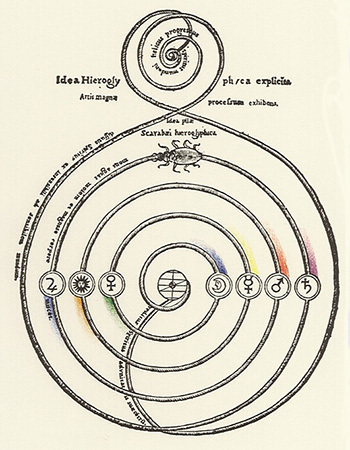 We shall encounter Athanasius Kircher (1601-1680) later, in connection with an exciting cosmological construction in which a scarab moves between the planets (Astrological connections). Kircher, who came from Fulda, was a versatile man whose activities included the teaching of mathematics and Hebrew. He also attempted to decipher hieroglyphs, and invented the concave burning mirror. More than 40 works by Kircher have been passed down to us, one of which appeared in 1646, and is specifically devoted to colours — «The Great Art of Light and Shadow» («Ars magna lucis et umbrae»). 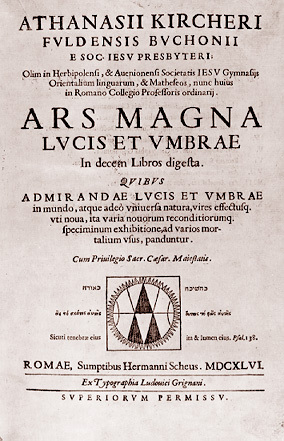 The first two words of the Latin title clearly point to the art of Raimundus Lullus, which will be described later (Ars magna). No wonder, therefore, that his system provides a firm idea of mixed colours, characterised by semi-circular bows. 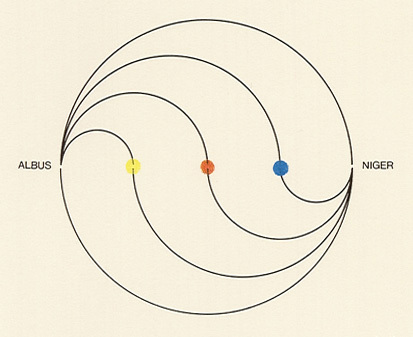 The basis for all combinations is a linear construction which, apart from white («albus») and black («niger»), operates with three colours, namely yellow («flavus»), red («rubeus») and blue («caeruleus»). We have no need to account for all arrangements here, and neither should we attempt the translation of all the many new names — subrubeus, for example, or fuscus, or incarnatus. The special position of green («virides») is noteworthy, however: like red, green is placed in the centre, although on the plane of the mixed colours, and not the pure colours. Green is located at the overlap of yellow and blue. 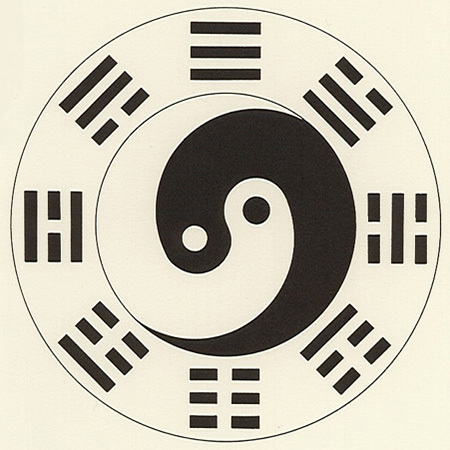 If we draw the bows running from white so that they are directed upwards, and the curves running to black so that they are directed downwards, an image will be created which resembles the Chinese Yin-Yang (to create this symbol, we need only retain the route through red, while omitting the lines passing through yellow and blue). As our illustration shows, all the colour points of the system can then be reached from white and black; with that it’s author’s fundamental view will become apparent. In fact, Kircher views colour as a «genuine product of light and shadow», as he says in the forward to his 1646 book, adding that colour is «shadowed light» and «everything in the world is visible only by means of shadowed light or illuminated shadow». Kircher’s book contains eight chapters which deal with the multitude of colours, investigate the colours of transparent stones, or query those of plants and animals, for example. Accordingly, Kircher wishes to know why four legged animals do not appear to be golden, and why insects and birds adopt all of the colours. Kircher also ponders why the sky appears blue — without arriving at a satisfactory explanation, however. But Kircher was not, of course, seeking this kind of answer. Nor would he have understood, had it been available to him. In Kircher’s day, the physics of light and colour had to bide their time. But it was not long before the appearance of the first optics which we, in our modern age, can begin to grasp. We will only tackle the question of optics properly, however, after Sir Isaac Newton takes a prism to separate the colourless light of the sun into its many colours. 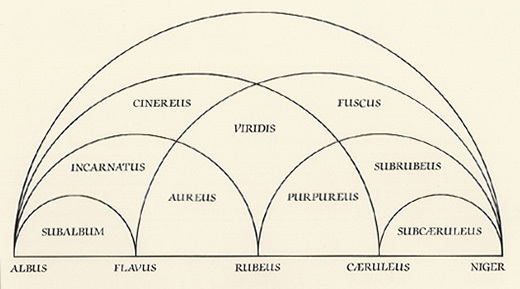 The prism, and its effect on light, was something already known to Kircher. He accounted for his colours by noting that the brightest occur after passing through the thinnest side of the glass, and the darkest after passing through the thickest side of the glass. He will, for the time being, be the last to consider the brightness of the basic colours and incorporate that brightness into his system. After more than 2000 years, the ordering of colours from bright to dark — as in Kirchers system — will then be lost to us, to re-emerge only during the 20th century. Bibliography: Kircher, «Ars magna lucis et umbrae», Rome 1646; J. W. von Goethe, «Geschichte der Farbenlehre, Part I», Munich 1963; J. Godwin, «Athanasius Kircher – A Renaissance Man and the Quest for Lost Knowledge», London 1979; John Gage, «Colour and Culture, Practice and Meaning from Antiquity to Abstraction», Thames and Hudson, 1993, pp. 9 and 233 (mention and comment).